Who is this Dr. Horsehair? 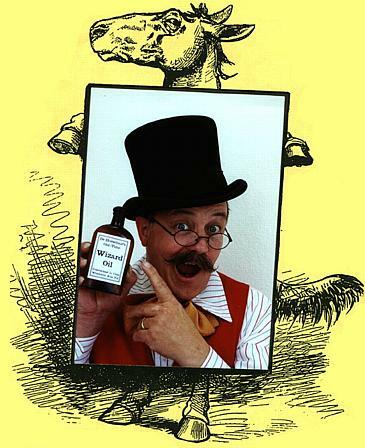 "I won't steer you wrong"
Click above to hear about Dr. Horsehair's Old-Time Wizard Oil!! Why, old Doc Horsehair has been around as long as I can remember. He has been a Steamboat Captain, a Buffalo Hunter as well as a Injun Fighter. He was a Bee Charmer for a while and then he started Dr. Horsehair's Old-Time circus where he had this strange lookin feller who played bones, and rode a mule name "Shootin Star" off a twenty foot platform into a tank of burning water. He didn't have wild animals but he did have a down right good fiddler named "Fiddling Toby" who had a bunch of trained goats. The act was called "Toby's Goats". They used to do algebra and stuff like that. Toby was also the circus cook and one day after one of his goats died, the hamburgers started tasting awful strange and all the folks started to get sick except Toby. Shortly after that, times went bad and old Doc lost his circus to the banks so he says "Boys, we can either form up a minstrel band and tour the country or we can get a honest job". Well, we sure didn't want no honest job so we formed up "Doctor Horsehair's Old-Time Minstrels" and we made a cassette tape and CD. Now, this was back in 1872 and cassette tapes and CDs were not invented yet, but ol' Doc sure had foresight and sold a bunch of them to all the folks who waited a long time before they could play them. 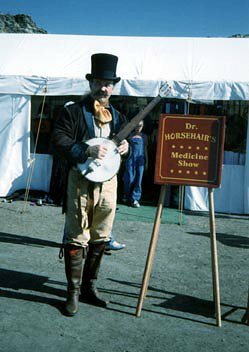 Who is Dr. Horsehair?. Why, he must be one of the smartest, most well traveled, and experienced men in American history. He is the smartest, because he is always thinking up things to sell like that "Wizard Oil", a magic elixir which he claims will "cure what ever ails ya, and make you feel like going a-bear huntin' with a hickory stick". He is the most well traveled because he is usually traveling about five mile ahead of the law for selling that stuff. He is the most experienced at finding likely customers to buy and better yet, swear by it. in front of his medicine show tent. One day while selling that Wizard Oil in a town of country bumpkins, some feller steped up and swore on his mother's grave that he had bought a bottle of that Wizard Oil and taken it home and given it to his old Grandpa Kiester who had been bed ridden for nigh-on to twenty years. He told all the people that after giving it to him for two weeks, his old Grandpa jumped out of that bed, went outside and split a chord of firewood. Then he said he went to town and bought himself a new suit of clothes. He also said his old Grandpa was now married to a twenty one year old woman and working in the circus on the flying trapeze. Old Doc sold a passel of that stuff that day but, I heard that before he left town with his pockets full of cash, old Doc paid that feller $20 for his honesty. Imagine that! Giving a feller $20 just because he's honest. That old Doc Horsehair sure has a big heart. Old Doc got out of that business when he got too old to run fast and started making tapes and CDs of some banjo picker name Bob Flesher. I heard a fellow tell a big crowd of people that this Bob Flesher was the worlds greatest clawhammer banjer picker but I think it was the same feller that had a Grandpa Keister and probably got paid another $20 for his honesty. I guess you'll have to decide for your self. Just buy a tape or CD from old Doc and make up your own mind and remember, he doesn't run so fast any more so its probably pretty good stuff.